Thiiiiis is the coolest cuckoo clock I’ve ever seen. It’s creepy and it’s kooky; it’s all together ooky. It’s from a different haunted family line-up, though. 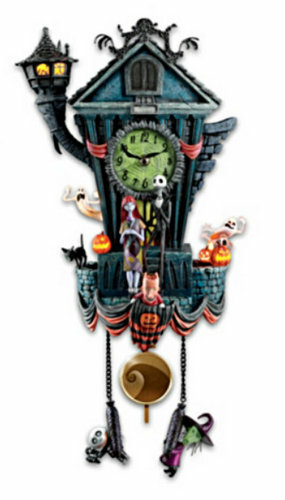 This Nightmare Before Christmas Cuckoo Clock has lights, music, and all the characters from the cult Tim Burton film. Plus, as a bonus, Zero pops out on the hour, in the place of a less-original cuckoo bird. But if they called it a Zero Clock instead of a Cuckoo Clock, that would just make it seem ridiculous. Zero starts to push on the door but doesn’t come out how can I fix this? I would contact Bradford Exchange directly, Bobbiejo. They should be able to help!